Awada has been curious about how things work since she was a little girl. At the age of 10, she disassembled her watch and put it back together because she was intrigued by the working parts. 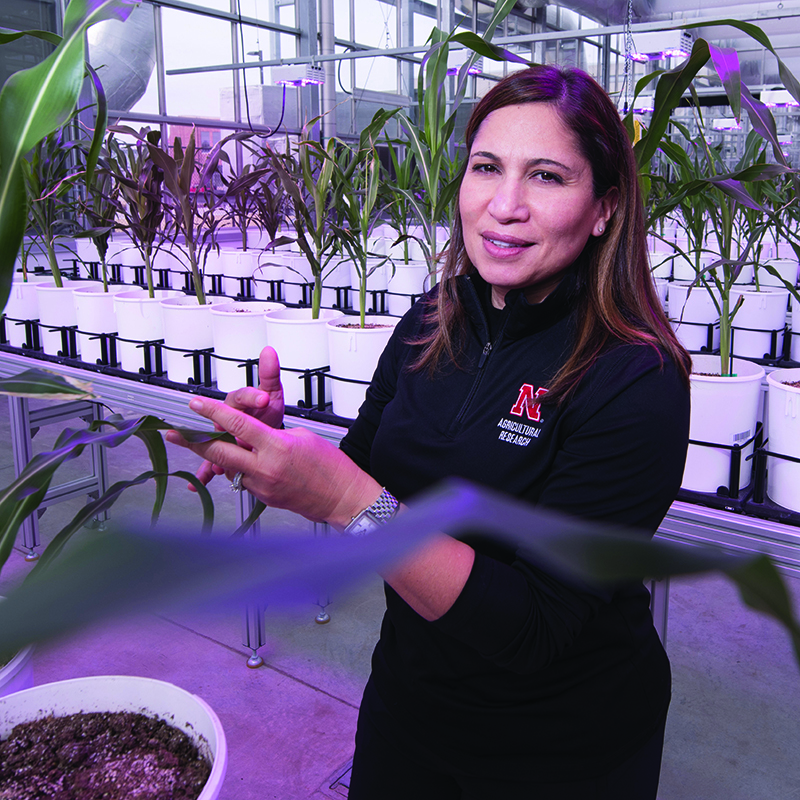 This curiosity is what led her to become a faculty member in the University of Nebraska–Lincoln Institute of Agriculture and Natural Resources and eventually, associate dean of research in the Agricultural Research Division (ARD). The Agricultural Research Division serves the University of Nebraska, as well as the state, by addressing critical issues in the areas of agriculture and natural resources through innovative research that ignites a global difference. Research in the Agricultural Research Division addresses important current and emerging issues in the areas of food security, human health, science literacy, natural resources, climate variability and economic vitality, Awada said. Since agriculture is Nebraska’s leading industry, the ARD is a vital component of the university. Awada serves on a team that supports faculty research, promotes innovation in agriculture and natural resource sciences and advances the ARD mission to meet its strategic goal that focuses on resilient food production systems that support a growing global population. It’s critical work and it requires resources. The investment in science research at the university is more than the substantial work that goes on in laboratories or in the fields. Education, outreach and Extension efforts across the state are critical for the continuation of sustainability of the agricultural system and for the vitality of rural and urban communities, Awada said. “I think it’s very important to be a global citizen, to develop shared values around issues related to our well-being. In the process, we create a better appreciation of one another and what makes each person and culture unique,” Awada said. “If you look through history, countries that have closed themselves failed in the end. We need to be part of a global community, learn about other cultures and appreciate our cultural differences to deal with the issues that are of importance, from the local to the global scale,” she added. Research drives innovation for the university’s Agricultural Research Division scientists, who work around the world toward solving these local and global problems. Scientists cannot create sustainable food systems in Africa from an office desk across the globe. “What we create may work here, but might not work there. We won’t know unless we are on the ground understanding where they’re coming from, their culture and their available resources,” Awada said. The ARD works to improve the global education of students through research, education, exchange programs and recruitment of national and international students. “The objective is to build better global citizens. We do not live in a vacuum,” she said. If researchers are going to solve issues of importance from a local to global scale, collaboration is one of the most valuable tools in the toolbox. “We act local, but we are part of a global community,” Awada said. Nebraska’s role as a primary beef exporter is a prime example of acting local and global, she said. The scope of this industry goes far beyond the Nebraska cattle rancher. “We are all curious; there’s never a dull moment in science,” Awada said. Her definition of science literacy, as a teacher and researcher, means educating students in a way that transforms their behavior, strengthens their critical thinking and helps them make better decisions in their daily lives. Taking that definition further, she said communicating science to the public helps people to make better decisions and helps them to separate facts from opinions, helps lead or drive policy and change in the community for the betterment of all human beings and the environment around them. Researchers have added responsibilities related to communicating science; they conduct relevant research and write their findings in journal articles that are shared with their peers; they attend conferences; they teach seminars. “The idea is to share your results with larger communities to have a larger impact,” she explained. Science literacy is the driving force behind the implementation of policies for the betterment of human beings and their environment. • Addresses priority issues facing Nebraska’s agriculture and food industries. • Provides the knowledge base essential for managing our natural resources. • Promotes family well-being and community development. • Educates future scientists through hands-on experience.